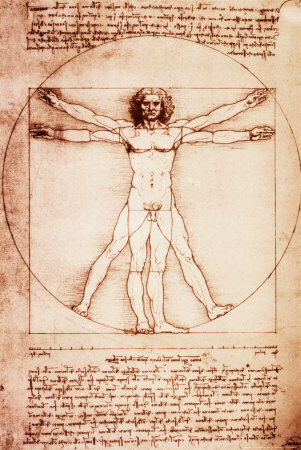 Leonardo Da Vinci was a Renaissance Master whose genius also profoundly impacted mathematics and the sciences. Insatiably curious and inventive, Da Vinci possessed unparalleled intellectual diversity. While scientifically studying light and shadow, he was able to conceptualize three dimensions and used the knowledge to impart his figures with their revolutionary lifelike quality. His works also reflected his insight into techniques for expressing atmosphere, depth, and the effects of age and emotion. Leonardo di ser Piero da Vinci (April 15, 1452 – May 2, 1519) was a Tuscan polymath: scientist, mathematician, engineer, inventor, anatomist, painter, sculptor, architect, botanist, musician, poet and writer. Born at Vinci in the region of Florence, the illegitimate son of a notary, Piero da Vinci, and a peasant girl, Caterina, Leonardo was educated in the studio of the renowned Florentine painter, Verrocchio. Much of his earlier working life was spent in the service of Ludovico il Moro in Milan where several of his major works were created. He also worked in Rome, Bologna and Venice, spending his final years in France at the home given him by King François I. Recommended books on Leonardo da Vinci: Leonardo's Notebooks, Black Dog & Leventhal Publishers; Leonardo Da Vinci: 1452-1519: The Complete Paintings and Drawings, Taschen; The Notebooks of Leonardo da Vinci, Oxford University Press, USA; Leonardo da Vinci: Revised Edition, Penguin (Non-Classics); Leonardo da Vinci: The Marvellous Works of Nature and Man, Oxford University Press, USA; Mona Lisa: Inside the Painting, Harry N. Abrams, Inc; Leonardo da Vinci, Master Draftsman (Metropolitan Museum of Art Series); Leonardo Da Vinci: The Complete Paintings, Harry N. Abrams. Available here are these Leonardo da Vinci posters and prints, among others: Female Head (La Scapigliata), The Last Supper, Vitruvian Man, Head of a Maiden, Mona Lisa, Portrait of Ginevra De'Benci, Portrait of Columbine, Self-Portrait, Fight Between a Dragon and a Lion, Giant Catapult, Leda and the Swan, Anatomical Drawing of Heart and Blood Vessels, St. John the Baptist, Study of a Child's Head, Portrait of Cecilia Gallerani (Lady with an ermine), Madonna of the Rocks, and Testa di Giovanetta.